Be it the office, or an evening out, or a party, there is a leather bag style here that will match the mood. This page links the various styles. Besides being a hand bag manufacturer and exporter, with a current capacity of 2000 pieces per month, we also offer a range of women's purse, and wallet designs to choose from. Wherever possible, the style code and dimension, in cm, is shown next to the product. The dimensions are width, height and depth. 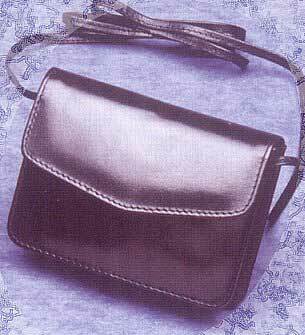 Description : A multipurpose evening bag with two compartments and flap using a magnetic fastener. The stylish long strap completes the sleek lines of this design. These handbag styles are grouped into sets. Click on the links to view the monochrome illustrations in the set.